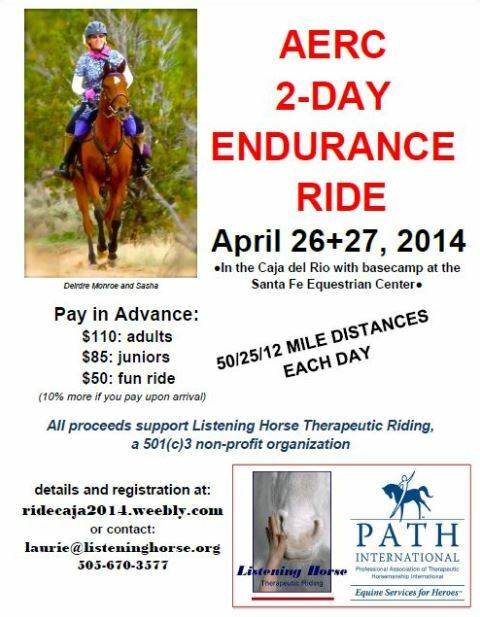 Come spend April 26-27 with us, competing in an AERC sanctioned endurance ride in the southern Caja del Rio, which is just west of Santa Fe, New Mexico! Haul in on Friday, ride Saturday-Sunday, and haul home on Monday! Our base camp will, once again, be at the lovely Santa Fe Equestrian Center. There's plenty of space in camp for large rigs and your equines will be stabled in covered pipe corrals. An arena has been set aside for warm up and turnouts! There will be plenty of horse water, with fun, well-marked trails (and good footing) on ride day. Riders will be treated to scenic vistas of the Rio Grande valley and Sangre de Cristo Mountains. We hope to have a good ride for the green horse and for riders new to endurance. This ride is being held by Listening Horse Therapeutic Riding, a 501(c)3 non-profit organization. Profits will be used to support their Santa Fe program. We encourage riders to raise donations for Listening Horse.